There are good air and rail links to Inverness and a regular public transport service is available from Inverness to Lochinver. For those travelling by car, the drive from Inverness to Inverkirkaig takes around 2 hours depending on traffic. Route details are given below. There are so many roads that lead to the North of England that they have not been described here. Take the A1 to Edinburgh. Along the A68, join the A720 Edinburgh by-pass. Along the by-pass, over the Forth road Bridge, then North on the A90 until near Perth, the road forks and the A9 takes you to Inverness. Get on the M6 if starting from the West side of the country. If you are starting from the East side of the country, you can take the A1 to Scotch Corner and then turn off on the A66. Head across the A66 until you get to the M6 then head north. Head up the M6 (which changes road number to M74 at the Scottish border) and take the M74 to Glasgow. Take the M8 through the centre of Glasgow till you come to the turn-off for the Irskine toll bridge. Pass through the toll booths and over the bridge and there is a turn-off on the left (the road sign shows it as a 'Y' junction) which is the A814 to Dumbarton. Follow this road through the town then take the A82 up to Fort William and on to Inverness..
All of the roads mentioned previously are normally very good and you can make good time to Inverness; if you intend to travel during the night, fill your tank before you leave Inverness, as from here on up, places where you can get fuel out of normal opening hours can be few and far between. As you approach Inverness, look out for the A96, signposted to Nairn. Take this road for about 0.5 mile and you will find a Tesco store / filling station where you can get food & fuel - check the opening times though. Head out of Inverness across Hessle Bridge on the A9 (signposted) towards Tore. Tore is around 7 miles from Inverness on the A9 and from Tore, head out on the A835 to Ullapool (signposted). It is generally free and clear from this point on. Just as you come in to Ullapool, there is a garage on the right but be careful if you are relying on this for a pitstop as they may change their closing hours from summer to winter. Winter closing for some of the garages, cafes and shops this far north can be fairly early so bear it in mind. The town of Ullapool is a fine stopping point. Along the main road, there is a lorry car park on the RH side there are public toilets that have showers. 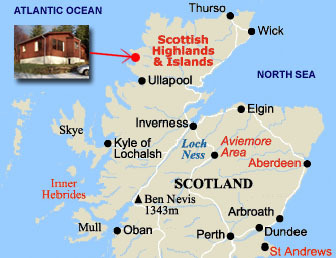 There is also aTesco store in Ullapool. There is a road parallel with the 'front street' that has banks, post office, chandlers and all manner of other stuff. Back on the road, head North out of Ullapool on the A835. You are now on some of the most unspoilt roads in the UK. The A835 between Ullapool and Ledmore Junction is 18 miles of truly amazing hills and bends with a fantastic backdrop of mountains. At Ledmore Junction, turn left and take the A837 towards Lochinver. At Inchnadamph you will see the ruins of a house and a small castle, both of which date from the 1500's. Look out for Deer, which come down from the hills during the rutting season and can be found in abundance during the night once you leave Ullapool. There are normally no problems with the sheep who tend to be streetwise and stay out the way. Journeys end is in sight when you drop down the hill into Lochinver. Stay on the main road through Lochinver until the road bends round to the right and you can see the fishing boats and jetties. On the bend, there is a turning to the left signposted for Inverkirkaig (Inbhir Chircaig). Carry on along this road, through Strathan and Badnaban and after a couple of miles you will come to Inverkirkaig. As you drop down the hill and approach the bay, there is a gateway on the right with a sign for 'Valhalla' on the wooden fence. Turn right here, over the cattle grid and 'Unst' is the first chalet you come to on the right. The name is painted on a stone by the chalet steps. Enjoy your stay at our But 'n ben! !